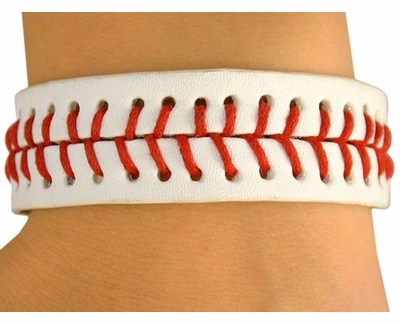 White Baseball Leather Bracelet with Red Baseball Stitching - Softball & Baseball Jewelry, etc. These White Baseball Bracelets are designed with Red Baseball Stitching and White Leather. Adjustable Velcro allows this baseball bracelet to fit Children thru small Adult wrist sizes. This Baseball Bracelet is even comfortable enough to wear during your game. White Leather Baseball Bracelet Measures 8 inches Long overall, and it measures 5 inches between the velcro areas. Ordered this baseball bracelet for a granddaughter that plays softball. Have not yet given it to her as it is for her birthday in Feb. But, knowing her like I do, I am sure she will love it.